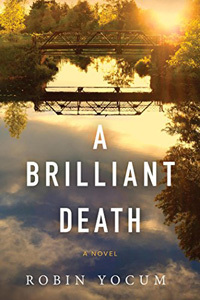 A Brilliant Death by Robin Yocum: Synopsis and Online Purchase Options. Synopsis (from the publisher): Amanda Baron died in a boating accident on the Ohio River in 1953. Or, did she? While it was generally accepted that she had died when a coal barge rammed the pleasure boat she was sharing with her lover, her body was never found. Travis Baron was an infant when his mother disappeared. After the accident and the subsequent publicity, Travis's father scoured the house of all evidence that Amanda Baron had ever lived, and her name was never to be uttered around him. Now in high school, Travis yearns to know more about his mother. With the help of his best friend, Mitch Malone, Travis begins a search for the truth about the mother he never knew. The two boys find an unlikely ally: an alcoholic former detective who served time for falsifying evidence. Although his reputation is in tatters, the information the detective provides about the death of Amanda Baron is indisputable — and dangerous.